1760: Born in Rowan County, NC to Benjamin and Rebecca Will Brimer. Brother of Jesse and William (twins) Brimer. 1761: Future wife, Celia Heard, was born January 17, 1761 in the Abbeville District of SC to parents Thomas Heard (1719-1774) and Polly McDonald (1723-) who married in 1738 in Pennsylvania. 1780 Feb.: Joseph Brimer and Celia Heard marry in February in Ninety Six District, Abbeville, Greenwood County, SC by acting magistrate Mr. Moore. She was 19. Marriage celebration held following day. Joseph was a farmer. They would have nine children. 1780 Battle of Kings Mountain: Soon after their marriage, Joseph Brimer volunteered to serve in the North Carolina Militia during the Revolutionary War, serving as a Private for a total of about 7 months between late 1780 and late 1781. He participated in four (4) major battles during his service. He initially joined a North Carolina militia group commanded by Thomas Sumter sometime in September, 1780 when the call went out to destroy the British who were advancing to burn out the backcountry patriots. As the group trekked toward the Cow Pens to meet up with the OverMountain Men, Sumter left the group, transferring shared command to Colonels Edward Lacey and James Hawthorn. Nearing the Cow Pens, Joseph's group met up with a group commanded by Colonel James Williams, who then took command of the entire group of about 450 men, and led them to Cow Pens. Apparently Joseph was under the command of Colonel Williams during the actual Kings Mountain battle of 7 October 1780, fighting on the south side of the mountain, although he may have been excluded due to illness or injury. He returned home and resumed farming. 1781 Battle at Guildford's Courthouse: Joseph Brimer volunteered when called upon by rejoining the NC militia. Brimer was one of the Patriots battling Lord Cornwallis. 1781 The Seige of Ninety-Six: Joseph, who had returned home, became involved in battle again as one of Greene's Patriot again when the Seige of Ninety-Six began just four miles from his home. He would slip home every few days, but then rejoin this difficult and failing battle. 1781 The Battle of Eutaw Springs: This was a the last major battle of the Revolutionary War in the SC and ended when the British forces vacated to Moncks Corner. Joseph Brimer was lucky to have survived this battle; many did not. He was lucky to have survived all of these 4 battles. About a month following the Eutaw Springs battle, Joseph and Celia's first child, William, was born on October 13. Just a week later Lord Cornwallis surrendered to Washington at Yorktown. A MUST READ!! Click HERE for more on Joseph Brimer's war narrative written by Mike Brimer. Thank you so much Mike! 1800 Census Pendleton SC for Joseph Brimer: 2 Free White Males Under 10; 1 between 10 and 15; 1 between 26 and 44. 1 Free White Female 10-15; 1 between 26 and 44. Total number in household under 16 is 4. Total number in household over 25 is 2. Total household: 6. 1808: Joseph and his family moved from the Pendleton District to Hall County GA.
1820 August 7: Census Pendleton SC for Joseph Brimer 1 Free White Male between 10 and 15; 2 between 16 and 25; 1 over 45. 1 Free White Female over 45; 1 between 10-15. Foreigners not naturalized: 4 Total number in household under 16 is 2. Total number in household over 25 is 2. Total household Free White Persons: 6. 1853 Feb. 22: Celia Heard Brimer passed away in Chandler Creek, Hall County, Georgia at age 92. 1) Benjamin Brimer b. Oct. 13, 1781 and died after 1850 in Blount County, Alabama. Per 1850 Census Benj. Brimer and his wife Anna live in Blount County, AL where he is a farmer and is 70; Anna 68. Next door to them is Joseph Brimer's family (wife Eliza, children Wm, Anderson, Benj., Daniel). 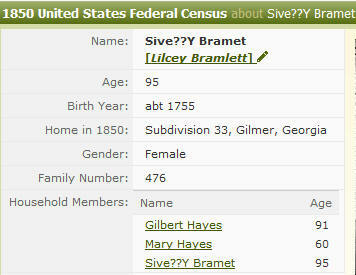 2) Mary Brimer b. June 13, 1782 and died after 1860 in Gilbert County, GA. Married 1811 to Gilbert Hayes. 3) William Nelson Brimer b. 1797 and died 1872; m. Jane McCreight or McWrigh t or McRight in 1834. She died 1880 in Heflin, Cleburne County, AL and is buried at the Black Cemetery which was originated by the Black Family. Other Brimers are also interred there. See this for origin of the cemetery and internments. Also this is from findagrave.com: Jane born 1805. Children: Peggy, Emaline (Emma), Wm. Henry Harrison (Dute), Sara Jane, John F., ZT, and Jonathan Greenbury Brimer. 1860 Census Calhoun AL for Nelson and Jane Brimer states Nelson was 63, born about 1797 and Jane 56 born about 1804/5. findagrave information on Jonathan Greenbury Brimer: Born January 1849 and died June 18, 1929. Son of William Nelson and Jane Brimer. 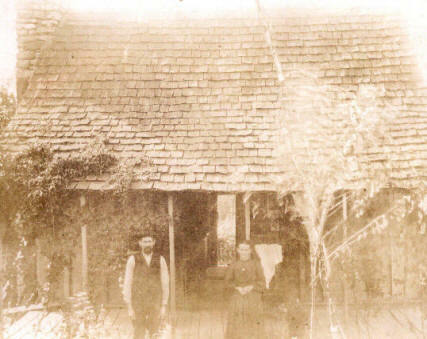 Jonathan and Adeline Brimer (1848-1931) had children: Robert Lee Brimer, William M. Brimer, Whitlock Brimer and Rosetta Brimer. Jonathan is buried at Harmony Baptist Church Cemetery in Choccolocco, Calhoun County, Alabama. 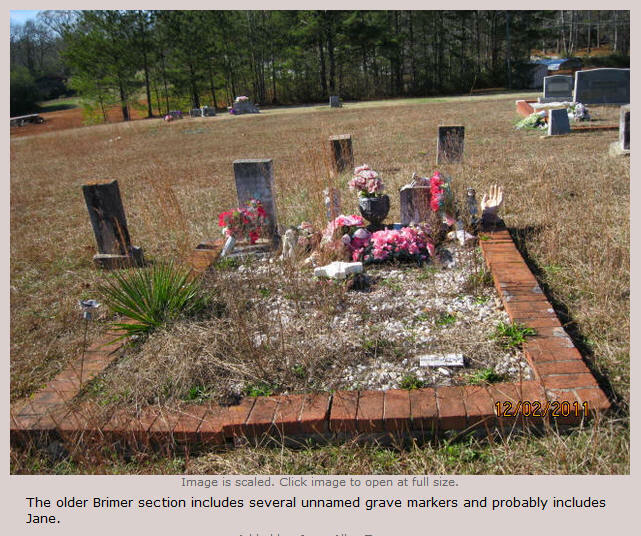 The findagrave site shows these two with same birth/death years. The flat stone calls him Green J. Brimer; the regular tombstone called his J. Green Brimer. The small flat one indicates "Green" was in the Confederate States Army, Pvt. Co. C., Hardies Ala, Cav. Bn. 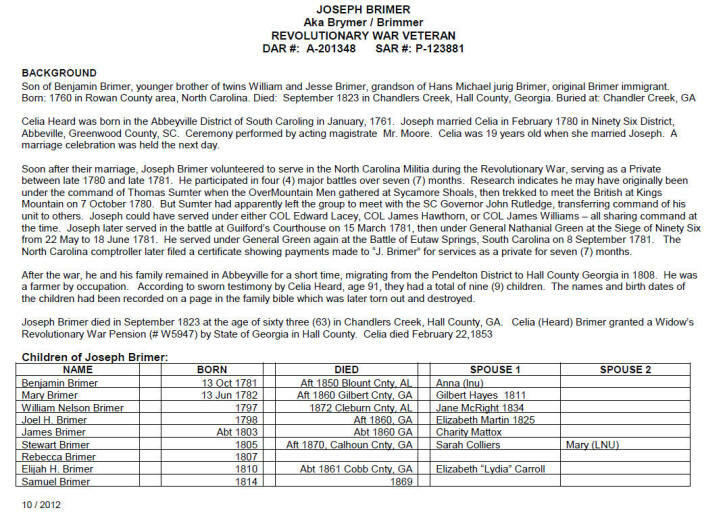 4) Joel H. Brimer b 1798 in GA. Married Elizabeth Martin Sept 8, 1825 in Hall County, GA per GA Marriages to 1850. 6) Stewart Brimer, b. 1805 and died 1870 in Calhoun County, AL. Stewart married (1) Sarah Colliers (2) Mary LNU. 8) Elijah H. Brimer, b. 1810 and died 1861 in Cobb County, GA; m. Lydia Elizabeth Carroll. Elijah Brimer (spelled Bremer) is located in the 1850 Cobb County census in the Powder Springs district. HH#1144: Bremer, Father Elijah H., age 40, overseer, born GA; Mother Lydia, age 38; Son William, age 13; Daughter Lucinda, age 11; Daughter Amanda, age 9; Son Simeon, age 7; Son Alexander, age 5; Son William (another one? ), age 3; Daughter Rachel, age 1 - all born in Georgia per Linda Smith Murray. Elijah's daughter Amanda born around 1841 married Henry Mitchell 15 Aug 1867 in Cobb County. She died 3 Jul 1922 and is buried at Bethel Baptist Church on Spring Road near Smyrna in Cobb County. Elijah's son Simeon Brimer born about 1843 married Analine Rutherford December 31, 1871, Book A, page 369 of the Cobb County GA marriage index.